Luton chief Nathan Jones knows full well he can’t hold midfielder Alan McCormack back from a return to the first team for much longer. The 34-year-old hasn’t featured for the Hatters since suffering a groin injury against Wycombe back in September, and then picking up a calf problem during his time out. We brought Alan to be a big part of what we wanted to achieve and he still has a big part to play. 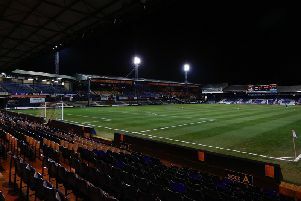 Although he has trained with the squad for the past month now, McCormack is yet to even feature on the bench for Town and when asked if the former Brentford player remained an option over the final nine games of the season, Jones said: “It’s about minutes, but we’re going to have to bite the bullet sooner or later if we’re going to put him. “The trouble is we’ve had two development games called off because of the weather, so that’s limited him. “We brought Alan to be a big part of what we wanted to achieve and he still has a big part to play. “He knows that, I speak to him on a regular basis because he’s a strong character, so you need to do that.